In the following example we're going to create a simple url protocol (like mailto/http etc) handler, e.g. 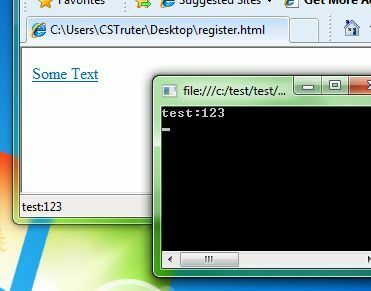 Next we're going to create a very simple console application (test.exe) handling our request, we pass values to the handler via command line - in this case the hyperlink passing the command line. Once we click on the test:123 hyperlink in the first snippet, you will notice a console application popping up - displaying the values passed to the protocol. Note that browsers encode passed values differently, so make sure that you've tested your handler in multiple browsers.